Over 30 years ago, in his mothers garage in southern Johannesburg, South Africa, Monty Jacobs decided to turn a passion for automobiles into a business that would change his life and the lives of those around him forever. After realizing just how much potential there was in the transmission repair business Monty extended an offer to his brother Leon to join him in building his new company and the rest is history. Together they opened Gearbox City and with a lot of hard work and perseverance it grew to be the best transmission shop in all of Johannesburg. In the early 1990's both brothers made the decision to immigrate to the United States to escape the crime and impending political corruption. They wanted their children to have the same opportunities that they had growing up, the kind of opportunity that would never be quite the same in South Africa again. Their decision to leave family and friends and booming business behind was never an easy one. Arriving in the US with little more than a few suitcases and some old furniture, their brother who had come years earlier, was gracious enough to sponsor them while they got back on their feet. In 1993 Monty and Leon, somewhat apprehensively, purchased a small piece of property in a field on a quiet road in Mauldin, SC. They built one building with eight bays and two lifts. As business picked up they added more lifts, and shortly thereafter they began to outgrow the property. They purchased the adjacent lot, and built a second addition to the building. That property is where Advanced Transmissions still sits today. That same road now sees over 30,000 cars pass by each and every day. In 2006 Leon and Monty's sons Gareth and Delwin decided to accept an offer to join the company and have been working together ever since. As a family owned and operated business we can still afford to take the time to explain the ins and outs of your repair, so that you can relax and leave the repair to us. We give a nation wide 2 year/24,000 mile warranty and should you have to use that warranty we stand behind it with no fine print. We only use the highest quality parts and processes available. 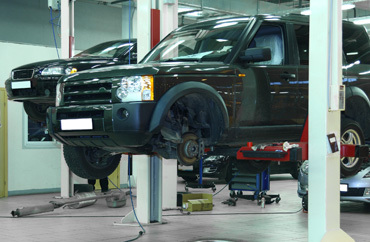 We consider ourselves to be state of the art in drivetrain repair.